HEIRLOOM. Very vigorous, climbing vines that are easy to grow. Asparagus Yardlong bears loads of slender, very long pods that are best picked when less than 18 in. long. It has a delicious, nutty flavor steamed, stir-fried or sauteed. It's easy to grow and has no serious pests or diseases. GARDEN HINTS: Do not work around plants when wet. 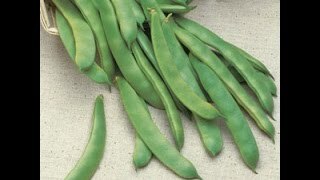 Keep beans picked for continuous bearing; shell mature pods and use as dried beans. Bean, Asparagus Yardlong is rated 4.5 out of 5 by 11. Rated 5 out of 5 by Zavia from MMMMMmmmmmMMmmMmm These are the best tasting green bean by far, no others are close! Rated 2 out of 5 by Rhonda from VERY long I was impressed with the size of each bean, but did not care for the texture when I tried to snap them. was not impressed with the overall bean. Rated 5 out of 5 by nsteff from Grow them every year! I got a pack of these for Christmas several years ago and I fell in love with them when I took the first bite. They need a sturdy trellis as they get much heavier than normal pole beans, but they will put out more beans every time you harvest. These are super easy to grow and so much fun to see people's reaction when you hand them a 12 inch green bean. Rated 5 out of 5 by Debbie456 from Amazing Bean! This is the first time I've planted the asparagus bean but certainly won't be the last! These things are amazing! I planted these using my cattle panel "trellis" and then planted a couple of other "trellises" with other varieties of pole beans. These have far surpassed any bean I have planted in the past with a much earlier crop than the purple king and Kentucky pole bean. The asparagus bean kept producing all through the hot dry summer we had here and now it's October 23 and I picked another bunch yesterday! My husband's co-workers were very excited about these beans and used them in a variety of different ways... from fresh in salads to stir-fries. These have a fresh light flavor (to me, anyway) but I have cooked them like I do green beans and they taste great. Rated 5 out of 5 by Natt from Spectacular Yardlong Beans!! 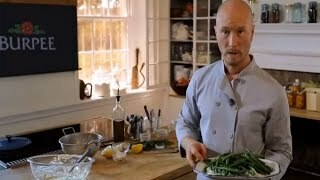 I have grown several different varieties of pole beans over the years but I wanted to try the yardlong beans after my mom reminisced about my grandparents growing them many, many years ago. I was not disappointed! These beans were outstanding and produced plenty of beans to keep my family of five (and a few neighbors) happily eating beans all summer long. They grew hardy and strong and yielded an exceptional harvest! I will definitely be growing these again year after year. Rated 5 out of 5 by Violet from Never=Ending Wonder This is the third year that we have planted Burpee Asparagus Yardlong green beans. We prefer their taste and texture to other green beans. The beans are planted in two rows 11 feet long each, supported by trellises. Because this crop is so prolific, we have been handing out fistfuls of the beans to neighbors passing by. My husband decided that, this year, he would measure the beans, end to end, to see exactly how much we are actually harvesting from these two rows. The count this season, with just a few stragglers left on the vines, is 1,239 feet! What champions these beans are! We have passed on seeds to our dentist, who has had no luck with other beans, and he is so enamored that he has passed some on to his barber. And so on and so on. One word of caution...pick every other day. The beans go quickly from lean and tender to "puffy,"
Rated 5 out of 5 by YankeePlanter from Early and prolific I planted only two poles of these beans last summer, figuring they might yield a small late crop. To my surprise, I began picking them in late-July, despite a miserable month of rain (14 inches in my rain gauge) in June, and the harvest continued well into September. For several weeks, they were the only beans I was harvesting in my garden. Note: It is important to twist the beans off carefully, as the vines will reflower from the same location repeatedly as long as you don't damage the buds. One more hint: plant these beans separately--meaning on well-situated separate pole--from regular pole beans--they need a lot of light and won't appreciate being shaded out. They actually will store in your crisper without any trouble for several days, but they do go off quicker than regular beans.